In the Junior Category Selangor Generasi 8 took a commanding lead throughout the tournament and wrestled the Championship title and Best State Medal award. Selangor Generasi 8 representing Selangor is in the lead in the Juniors' Category with 14 1/2 points, or 1 1/2 points ahead of the team whom they will meet next. 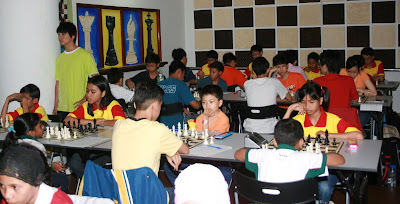 The 28th Astro Merdeka Standard Team Chess Championship 2008 garners 78 teams of which 36 are participating in the Open Category and 32 in the Junior Category. In view of the Ramadhan month which falls on 1st Sept 2008 and smaller number of teams the players agreed to reduce the number of rounds to 7 to be played over 2 days - 30th Aug to 31st Aug 2008. Time control is revised to 1 hour to the finish. 4 rounds will be played today while another 3 rounds will be played tomorrow followed by Closing and Prize Giving Ceremony. Play has just begun this morning at about 0930hr. 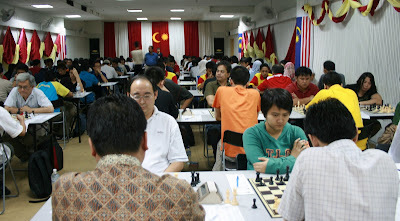 This will be the final series of this year's Malaysian Chess Festival 2008 and will be the last chess tournament to be held at the Wilayah Complex. 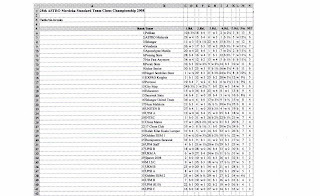 32 Teams are in this Category with Selangor State Team seeded at the top. GM Yasser Seirawan with his famous d4 opening took on 3o players in a simul match last night. 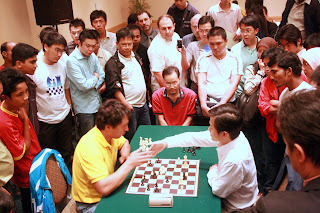 Dato' Tan Chin Nam and fellow MCF officials also took the opportunity to challenge the Grandmaster at his own game. 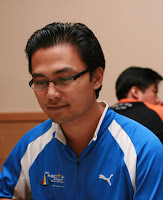 After a few quick losses amongst the players Faizal Andin secured a draw and soon after a win by Lee Mun Keong. This was followed by two more draws through Mohd Irman and Justin Ong . From then on there were strings of losses on the participants. The game with Fariz Shafruddin however crossed over the midnight. The chess clock was set at 5 minutes each so as not to drag on any longer in a knight vs bishop end game. A wrong knight turn was duly punished by Fariz's passed pawns and he had to concede another loss. All in all GM Yasser won 25 games, 2 losses and 3 draws played over 4 1/2 hours. 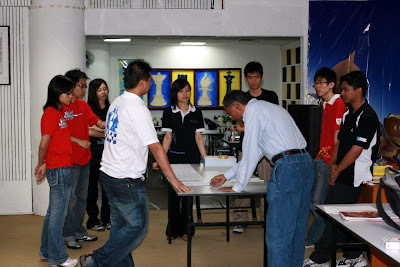 Round 1 has started on 26th August 2008 and the subsequent rounds will be played to end on or about 4th September 2008. 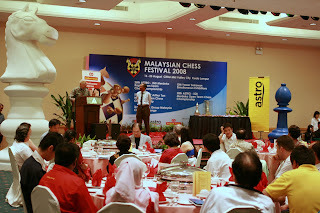 The Tournament is timed to coincide with the Malaysian Chess Festival 2008 which sees a gathering of top international players in the country. 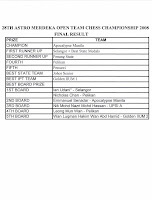 Note: The final event of this year's Malaysian Chess Festival - The 28th Astro Merdeka Open Team Chess Championship 2008 commences this weekend 29th Aug to 1st Sept 2008 at The Chess Network, Wilayah Complex Kuala Lumpur. Ms Tan with GM Iuldachev Saidali on her right, GM Dzumaev Marat to the left, and Mr Gregory Lau, Hon Secretary of Malaysian Chess Federation on the far right. Chess is the best therapy for an alert mind. 76 players signed up to play in 9-Round Swiss format to qualify for the top 8 knock-outs. GM Li Chao b emerged Champion for the second time in a row. The Championship started off with players from Uzbekistan and Indonesia slugging it out with GM Zhang Zong of Singapore (formerly a PRChina national) keeping the pace. He suffered a setback at Round 6 in the hand of GM Susanto Megaranto and earlier on a draw with China's GM Li Shilong but never looked back since, needing just a draw in the last round to clinch the title. A few milestone were achieved in this Championship. Malaysia's FM Lim Yee Weng should qualify for his IM title when he broke through the 2400 rating threshold. 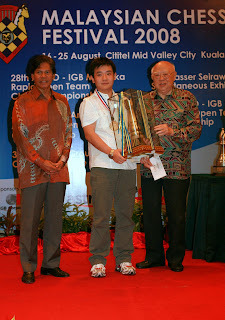 He earlier took the Royal Selangor Open 2008 title last May. WIM Irene Kharisma Sukandar of Indonesia too performed well. That should earn her the second norm in her bid to secure the WGM title. IM Mas Hafizulhelmi could only about maintained his level of performance. There were missed opportunities and maybe even blunders along the way but that should be lessons learned to progress further.